Here is my total twist on the classic chicken and waffles. 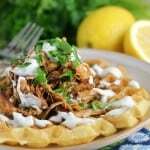 Tender chicken slow cooked with honey and Sriracha, then shredded and served on buttery buttermilk waffles with a Buttermilk Ranch dressing. 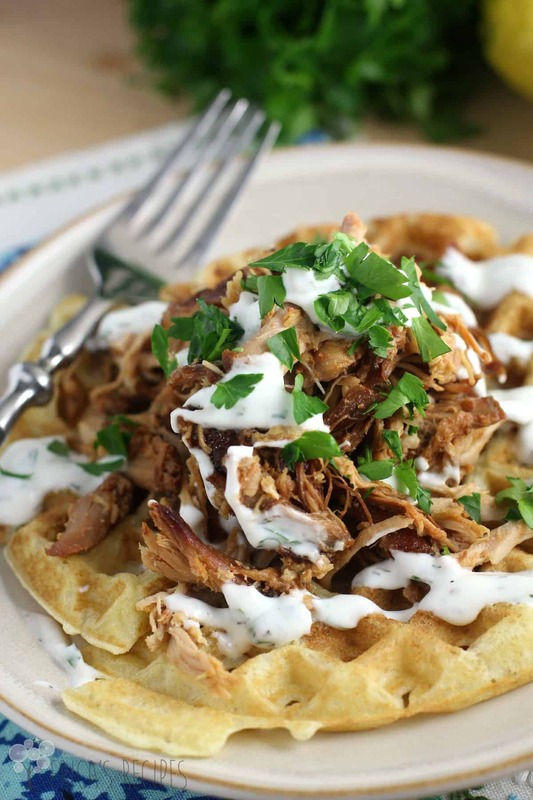 Honey Sriracha Pulled Chicken and Waffles is a dish foodie dreams are made of. I got a new toy to make this dish! Picked up the cheapest little waffle iron I could find, specifically to make this recipe idea become Saturday dinner reality. My daughter immediately asked to have another batch of these waffles for breakfast the next day …OK Peanut, twist my arm… and I shared with you the glorious Sunday Morning Buttermilk Waffles that resulted. But that was just the beginning. This recipe here was my goal. So there is a hella-lot going on here, but it is easy. Just trust. The chicken is super simple – toss in the slow cooker, then shred it. The dressing is easy – just whisk the ingredients together. And the waffles, as I learned, are very easy too – just make a quick batter and make them happen. So the recipes here for the Buttermilk Ranch dressing and the Buttermilk Waffles could both be used erywhere else. On their own, they are amazing. The dressing would be great on a salad (no way, right? …just thought I should still point that out). Or today I’m having some with chicken and arugula in my lunch wrap. All kinds of possibilities. And the waffles are soooo delicious too. When I made them for breakfast, I added a little sugar and vanilla to the batter for sweet vice savory, so that recipe is just a little different. Both are amazing – I think adding butter rather than vegetable oil makes all the difference. The chicken is crazy easy and crazy tasty. The idea there came from my grocery store. Before the Superbowl, my store had samples of wings grilled with a honey-Sriracha sauce. That planted the seed. 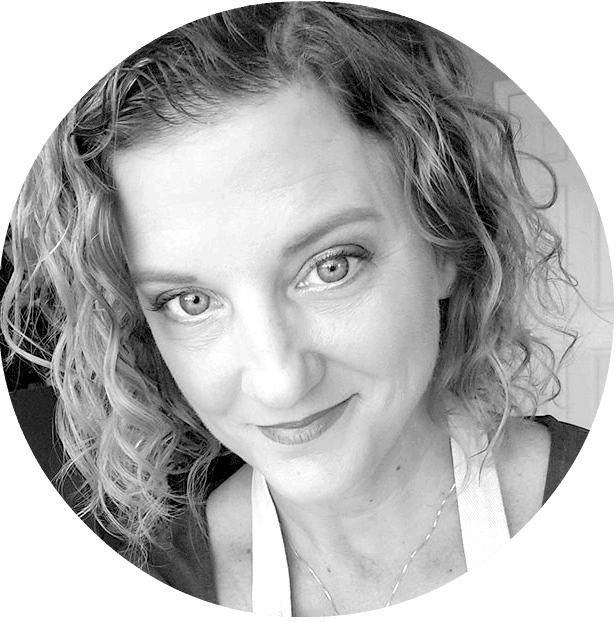 How I went from grilled wings to pulled chicken and waffles I can’t tell you. But honestly, I am giving myself some pretty major props that I did. Now eating all this awesomeness? I ate the dish in the photos. With a knife and fork. My husband folded his up all sammie-like. 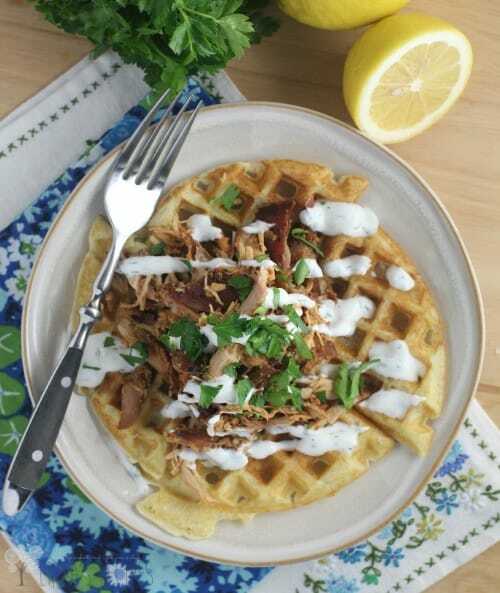 Both methods are perfectly acceptable to get your chick’n ‘n waffles on with this delicious recipeeee! 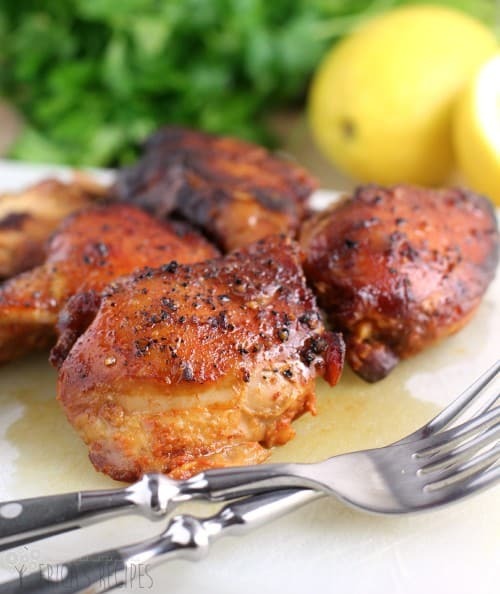 To prepare the chicken, season the chicken thighs with salt and pepper add to the crockpot. Whisk together the honey, Sriracha, and soy sauce and pour over the chicken. Cook on low 8-10 hours. Shred the meat using two forks. Set aside. 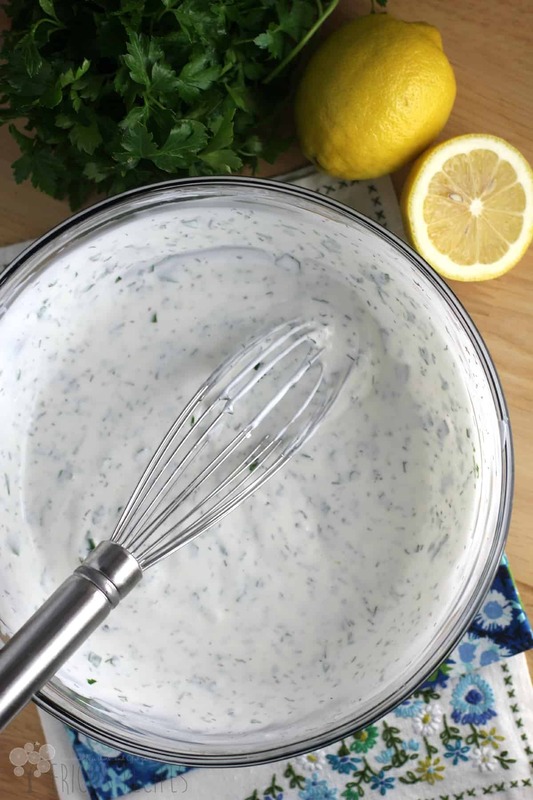 To make the Buttermilk Ranch, simply combine the listed ingredients. Store in the refrigerator until use. To make the Buttermilk Waffles, whisk together the ingredients listed in the order given. Cook to golden brown in the waffle iron. Waffles can be put on a rack on a cookie sheet and kept warm in a 200F oven while the rest of the batch is cooked. In my waffle iron (which is smallish), I get 8 waffles using 1/2 c batter for each. Serve the waffles topped with pulled chicken and Buttermilk Ranch. Sprinkle fresh parsley over top. Yield: 4 servings. 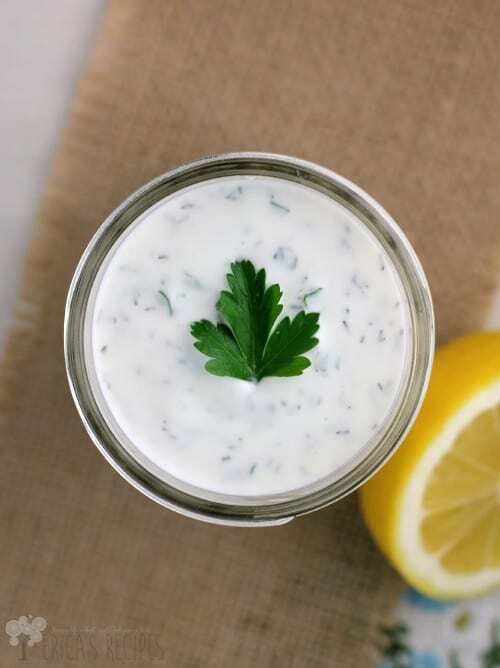 The Buttermilk Ranch dressing can be made a day ahead. Also, my ranch recipe here is on the thick side - you can always add a bit more buttermilk to thin it if desired. 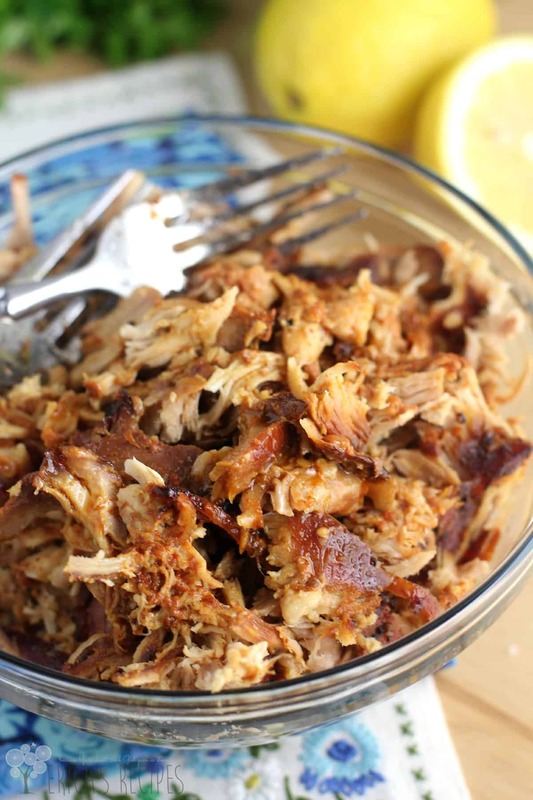 If you transfer the shredded chicken from the crockpot to a bowl or something, be sure to add plenty of sauce from the crockpot to keep the meat moist. 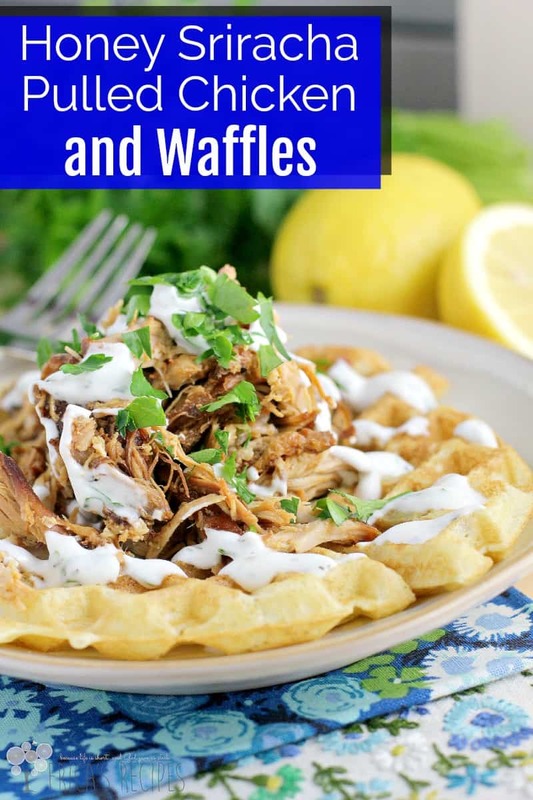 I can honestly say I’ve never had chicken and waffles, but now this recipe makes me want to make my own. What a great idea and I love pulled chicken. We always have Sriracha sauce on hand. Used generously by my husband. He will love this combination! Everything about this dish screams “delicious”. Love the caramelization on that chicken! My heart is beating faster! Mmm love this take on chicken and waffles! 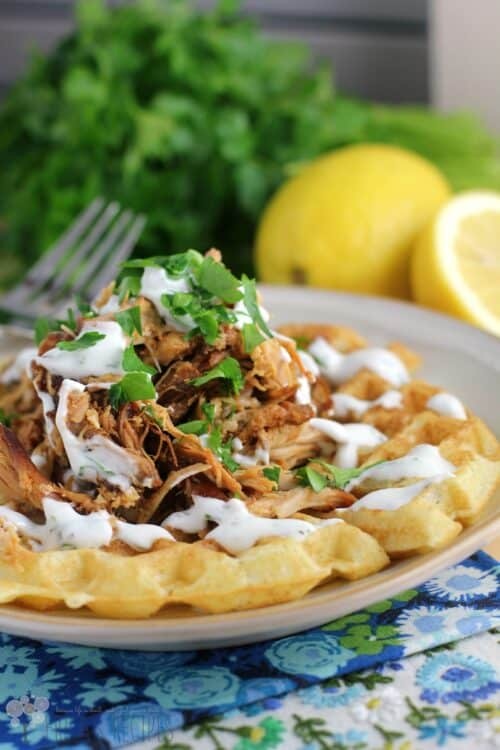 Love the idea of using pulled chicken instead of fried 🙂 Loving that you topped it with that beautiful homemade buttermilk ranch dressing too. YUM! Please can I stop by for dinner?! This is wonderful…every bit! Mmmm! wish I can have a bite! Pinned and tweeted. Erica, you have outdone yourself with this dish! So much yumminess!! Beautiful dish, Erica! Looks really good!! Wow! This looks so fantastic…I’m thinking soft tacos with that pulled chicken. Yum!